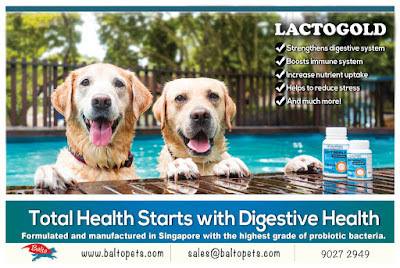 When Balto Pets Essentials first approached me to be the 'spokesdog' for Lactogold Probiotics, truth be told, mummy was very skeptical about it. Mummy is not a big believer or fan of adding supplement(s) to our current diet unless really necessary. She also believes that for any supplement and/or food that any of us (dogs and/or cats) represent, it has to be beneficial for all my other furry friends and not just endorsing it for the sake of some sponsorship or monetary reasons. Here is mummy's rationale: "Probiotics? I might as well just buy natural yoghurt." But okay, mummy is probably too lazy to even get to the supermarket to buy us the yoghurt (we LOVE yoghurts!) unless for a special treat. 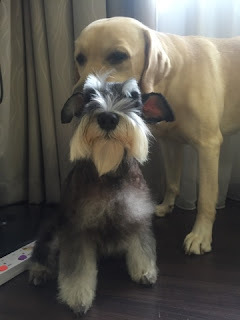 Mummy cares a lot about us but she is the "do what is necessary" type over the "overindulgent" type. 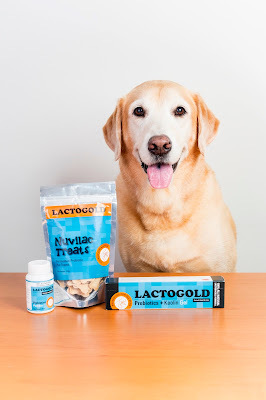 So before mummy said 'yes' to starting us on Lactogold Probiotics, she spent hours talking to Auntie Elizabeth and Ann Marie to understand more about this product and some of its claims. Mummy also spoke to her trusted advisers to get their opinion. 50% - she likes Auntie Elizabeth and Ann Marie. She knows that they stand for the product they sell and won't sell things that will not benefit animals. 50% - Do we really need Probiotics as a supplement? 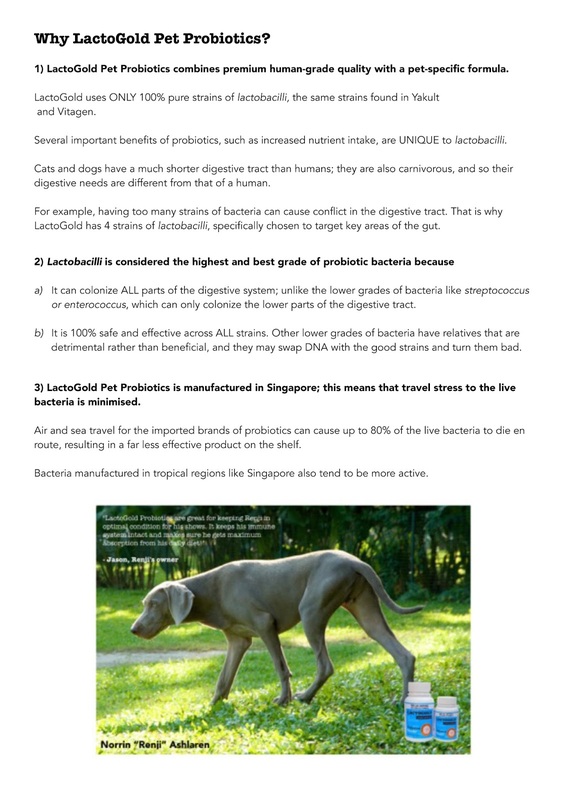 For more in-depth understanding of Lactogold Probiotics, read this Q&A with Dr Chia, the man behind the formulation and manufacture of LactoGold Pet Probiotics in Singapore. 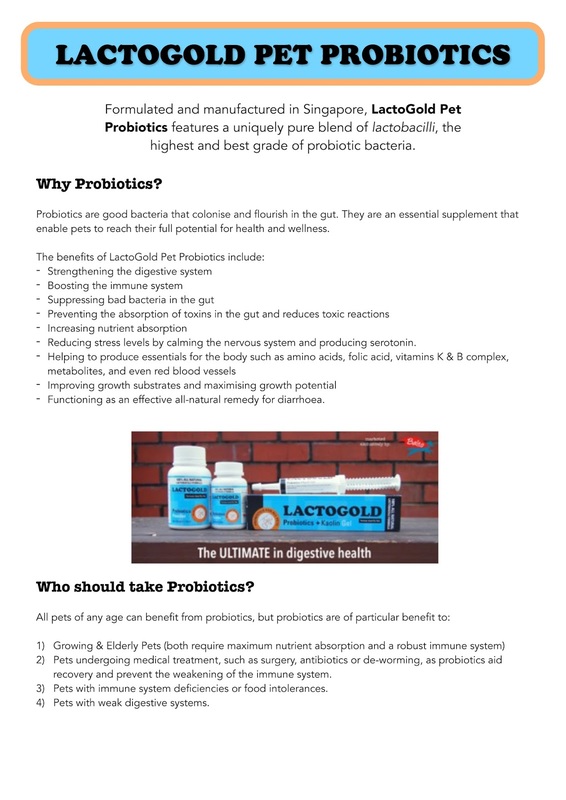 After much consideration, we decided to give this product a go and trialled it for a month before deciding whether to represent Lactogold Probiotics. 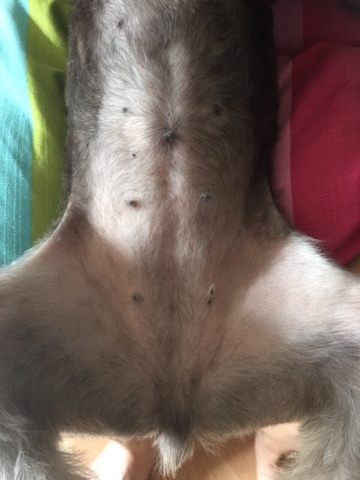 Me, Flapper Choo - I am a healthy senior dog and have no known health problems at this point, other than bad hips since the day mummy adopted me. During the trial period, I was on a short course of antibiotic for... I cannot remember what. And probiotics is supposed to be immune-booster so that was pretty much it. For me, it was more as a supplement to maintain my senior health than a specific cause/problem. Frodo's infamous never-ending ear guck. Pebbles Wong - Skin. 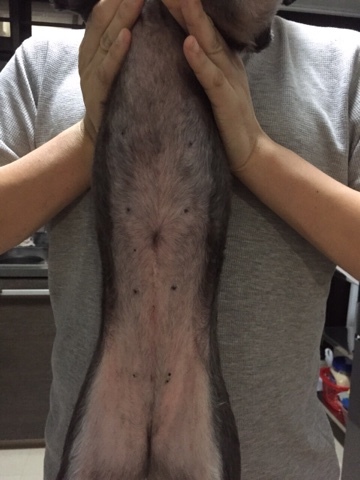 Miss Wong's skin has gotten better over the years after mummy corrected her eating habit and insisting to daddy she has to learn to eat like a normal dog. But now and again, she does still break out with a bit of rash. Fluffy Choo - Fur Loss. 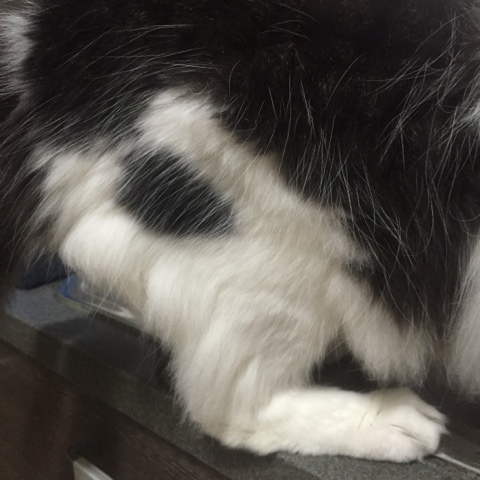 For the first time ever, went bald at his thighs and had a bald patch on his tail. Frappe Choo - Perfectly healthy. Just as a supplement. Nothing to observe. Frodo Choo - Ears. Reduced inflammation. Improved, yes. Total clearance, no. Recurrence, yes but that is expected unless mummy stops bringing us to swim. Inflammation, well controlled. No 'after' image to show. 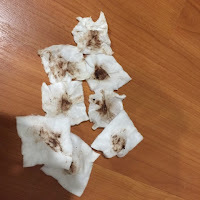 Just imagine reduced number of of gucky cotton pads. Pebbles Wong - Skin. Most significant improvement noted. 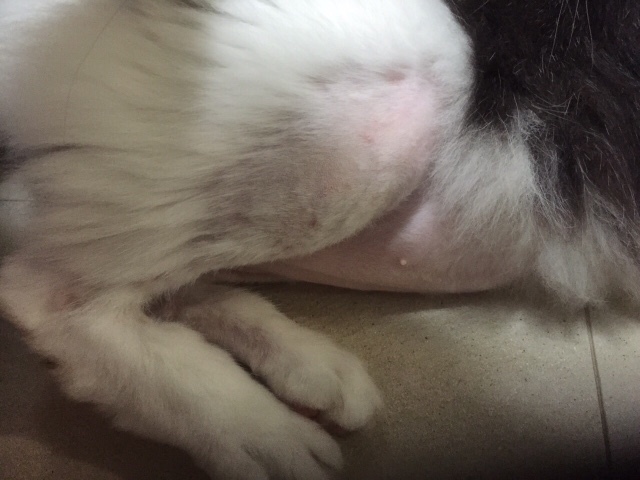 Within two weeks, the red spots at her undercarriage cleared. Recurrence, yes. One month later on Probtiocs... the red spots cleared. Pebbles today.As her skin improved, mummy decided to keep her glory schnauzer coat. But she is still permanently smelly girl from Frodo's slobber. Fluffy Choo - Fur. Fluffy's fur has grown back very nicely and he is all... fluffy again. Recurrence, no. 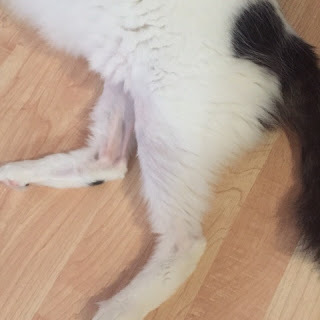 Fluffy's fur growing back after about 2 months. Fluffy's leg fur has grown back completely and so far so good! 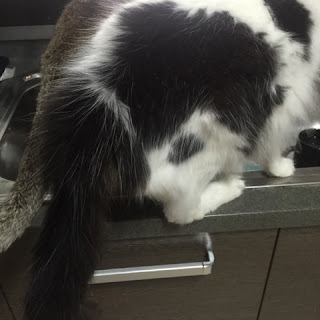 His tail fur has also grown back completely. Fluffy is living up to his name. 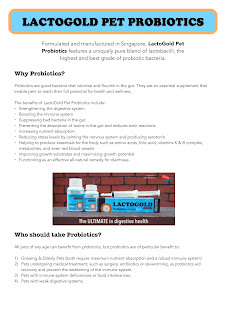 It has been 8 months since we started on the Lactogold Probiotics. Mummy does not religiously feed us the probiotics everyday. She gets lazy some times and will conveniently leave it out. The probiotics come in powder form and must be kept refrigerated so she gets lazy. However, thanks to mummy's stringent ways when it comes to our eating habits, we (including the cats) do not have problem eating it with our food. For believers in natural supplements for your pets, I guess it is worthy to note that its effects/benefits cannot be measured short-term. Certain measurable benefits can be seen quite quickly (i.e. Pebbles' skin) but it tends to be slower in treatment/effect. It is akin to traditional chinese medicine approach. The effects and benefits are seen at a slow progressive rate rather than NOW. I cannot comment on how much it is helping our immune system as we have no measure for that. But so far, I think we are doing pretty good on it. There is this other product called the K-Gel. K is for Kaolin. It is a form of clay found in nature. It is one of the oldest form of anti-diarrhoea medicine that can be safely used in large doses. When Auntie Elizabeth gave us the K-Gel, mummy rejected it as we rarely get diarrhoea. But Auntie Elizabeth insisted we keep it for "just in case". "Just in case" came in very handy when I ended up with a bout of diarrhoea after a wild swim at the sea. "Just in case" was very effective. My diarrhoea cleared within a day. Did you know... there are Lactogold Probiotics treats available too? 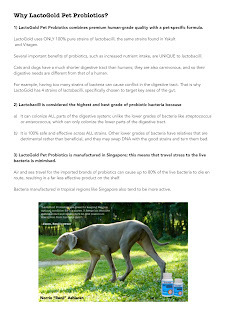 Probiotics are known to be beneficial even for humans. It is something that can be consumed safely so for the benefits it offers, there is really no harm adding it to your pet's diet. The biggest benefit of getting Lactogold? "The main and most obvious difference is that LactoGold probiotics is formulated and manufactured in Singapore. That means that consumers in Singapore are getting the freshest possible dose of probiotics. Extensive air or sea travel can adversely affect the live cultures of probiotics, meaning that many overseas imports arrive with a much lower live bacteria count than advertised."